Quick: Name the world’s greatest magician, a man who became famous by sawing women in half, making cards rise unassisted from their decks, pulling rabbits from audience member’s coats, and levitating assistants far above the stage. Harry Houdini? David Blaine? You probably didn’t say Howard Thurston, the sensational performer whose name was synonymous with stage magic a century ago. 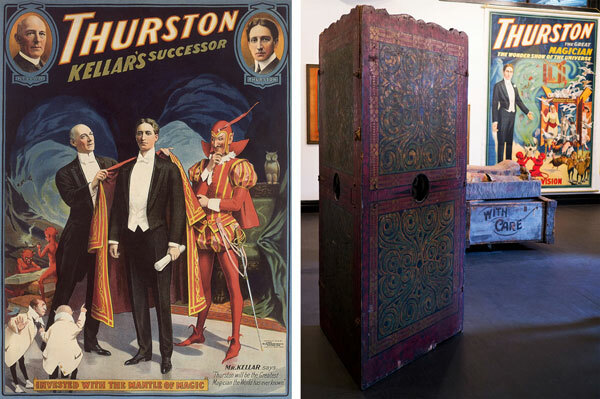 In an era when every city hosted marquee magicians, audiences around the world were transfixed by Thurston’s over-the-top productions, which proved that some mysteries are better left unexplained. But after Hollywood stole audiences away from magic shows in the 1920s and ’30s, Thurston was gradually forgotten. Not only did fictional films lure crowds away from shows like Thurston’s, but movies also turned one of his biggest rivals, Harry Houdini, into a larger-than-life figure. 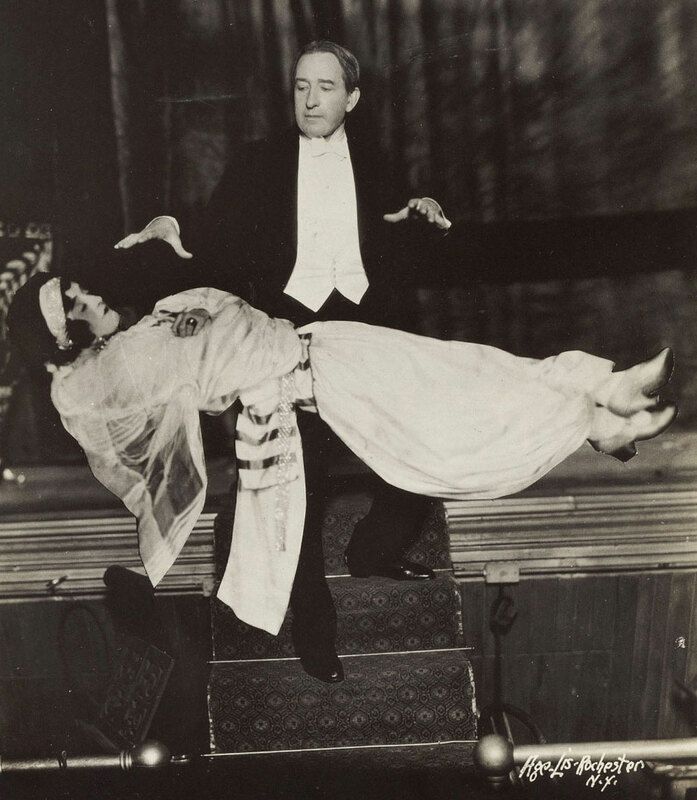 Top: Thurston levitates an assistant in a publicity still from 1930. Above: A view of the oversize Thurston posters on display at the Morbid Anatomy Museum. Images courtesy Rory Feldman. 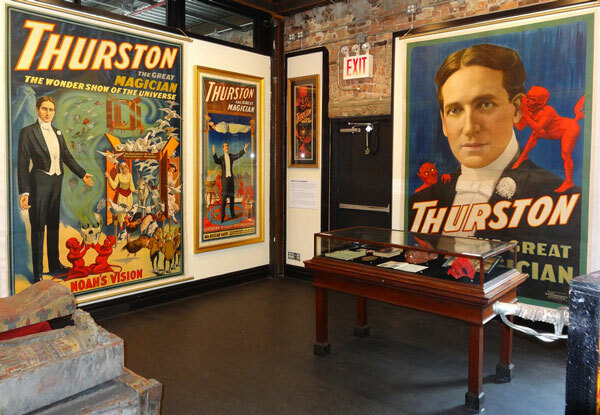 A new exhibit called “Do the Spirits Return?” at the Morbid Anatomy Museum in Brooklyn sets the story straight with an in-depth look at Thurston’s pioneering legacy and the otherworldly allure of his magic shows, using objects exclusively from Feldman’s renowned collection. Curators Joanna Ebenstein and Shannon Taggart trace the roots of stage magic back the spectacles of ancient shamans, who relied on faith in the supernatural to heal people and help them through difficult moments in their lives. Left, Thurston’s Vivisection Illusion, circa 1935. Right, Thurston pulled rabbits from audience members’ hats and coats and jokingly gifted them to their children. Images courtesy Rory Feldman. 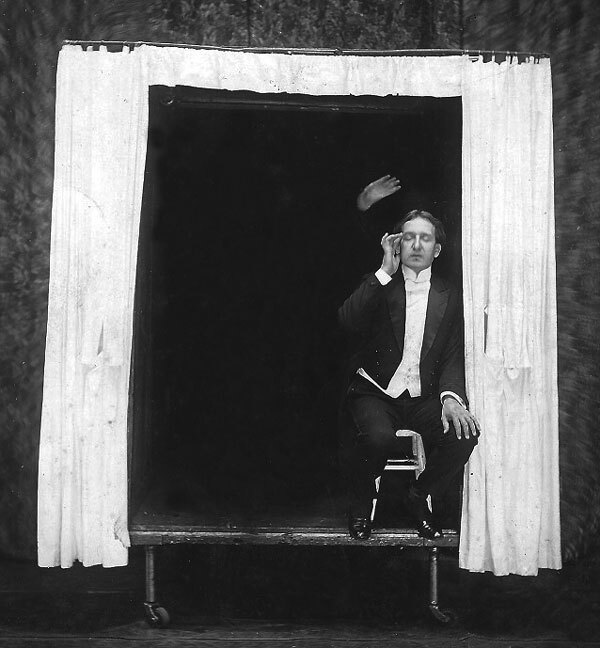 Thurston got his start performing small tricks on the street, working his way through the carnival circuit and eventually up the vaudeville ranks, where he charmed audiences with his witty banter and inimitable card tricks. In the 1890s, Howard and his younger brother, Harry, organized a traveling show of exotic dancers advertised as “Life in a Turkish Harem.” Thurston worked on his stage presence by warming up the tough crowds that came for his risqué show with a few card tricks. By this time, magic shows were an established genre of theater, traveling from city to city and usually playing midsize family-friendly venues. The performances often began with smaller sleight-of-hand tricks, moving to variety acts that included acrobatics, comedians, and spirit conjuring. The finale was often a high-stakes illusion involving human death or disappearance, such as Alexander Hermann’s Bullet Catch, wherein a loaded gun was fired at the magician and Hermann appeared to catch the bullets in his bare hands. During the 1890s, “Hermann the Great” was the reigning king of magic, and Thurston became determined to match his act in style and skill. Posters such as this one from 1915 played up Thurston’s connection to Spiritualism. Image courtesy Rory Feldman. In 1897, Thurston debuted his Rising Card Trick, whereby an audience member’s chosen card would rise slowly upward from a freshly shuffled deck, floating out of the pack and into Thurston’s open hand. He then threw the card directly into the lap of the person who had chosen it, a maneuver known as “scaling.” The effect was a huge hit, and by 1900, Thurston was booked for sold-out shows at the Palace Theater in London, where he also held private performances for dignitaries like Prince Edward and the Shah of Persia. Thurston’s act gradually became more elaborate, relying on the support of his right-hand man and comic foil, George White, plus any number of attractive female assistants, which included his first two wives and his daughter, Jane. Though Thurston’s reputation was built on his impeccable card manipulation, the show delivered a bigger punch after adopting special effects powered by complex motorized technology. During an era when few people had electricity in their homes, Thurston made use of modern machinery to power spectacular illusions involving effects of levitation and disappearance, or those featuring fire and water. In order to secure the most novel illusions, magicians often bought the rights to certain tricks, negotiated trades, or collaborated outright with other performers. The popular illusion of sawing a person in half, for example, was shared among seven franchised performers. While the saw trick was relatively simple to perform, its success depended on the magician’s ability to tap into the shifting social climate of the early 20th century. Thurston performing the Disembodied Princess Illusion, a version of the saw trick, in 1931. Image courtesy Rory Feldman. The Sword Box Illusion was another that relied on the lure of beautiful women in mortal danger. Image courtesy Joanna Ebenstein. Thurston’s popularity also benefited from a growing interest in ghosts and the occult. During the mid-19th century, a religious fad known as Spiritualism gained millions of followers as mediums claiming to contact the dead sprang up all over the country. At a time when new technologies and scientific discoveries introduced seemingly magical concepts into everyday life, everyone was looking for ways to communicate with ghosts—even Thomas Edison worked on a “mechanical medium” to contact the deceased. Archaeological discoveries in Egypt, like the finding of King Tutankhamun’s tomb in 1922, furthered the public obsession with the afterlife. Like other prominent thinkers, famous magicians became embroiled in the public debate over the supernatural. Houdini took the staunch position that all mediums were fakes and set out to publicly debunk them and destroy their businesses (frequently making headlines in the process), while Thurston favored a more nuanced view. Thurston agreed that many mediums engaged in trickery, but also believed he’d seen spiritual phenomena that couldn’t be explained by science. 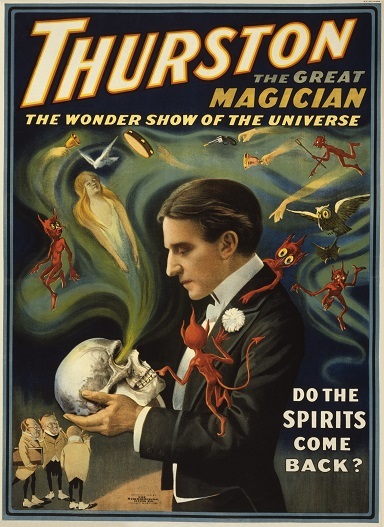 Of the mysteries he was unable to crack, Thurston wrote to Houdini, “I lean to the belief that these effects are produced by an intelligent force, which can manifest itself mentally and physically to some people under certain circumstances.” Regardless of what he believed personally, Thurston was aware of the profit to be made by exploiting the murky realm of religion, mysticism, and the supernatural. This photo, circa 1916, depicts a ghostly hand reaching from the darkness toward Thurston. Image courtesy Rory Feldman. 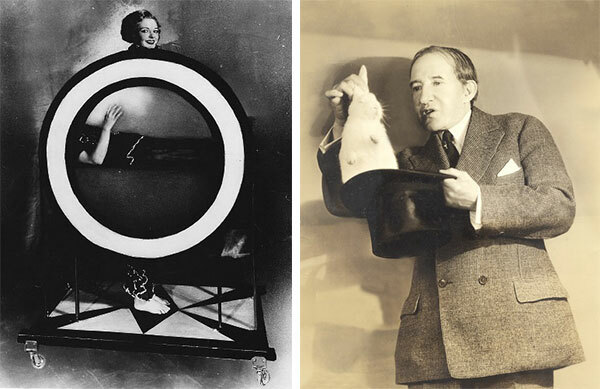 In 1907, Thurston paid $7,000 for the rights to magician Harry Kellar’s illusions and props, including the famous Levitation of Princess Karnac. 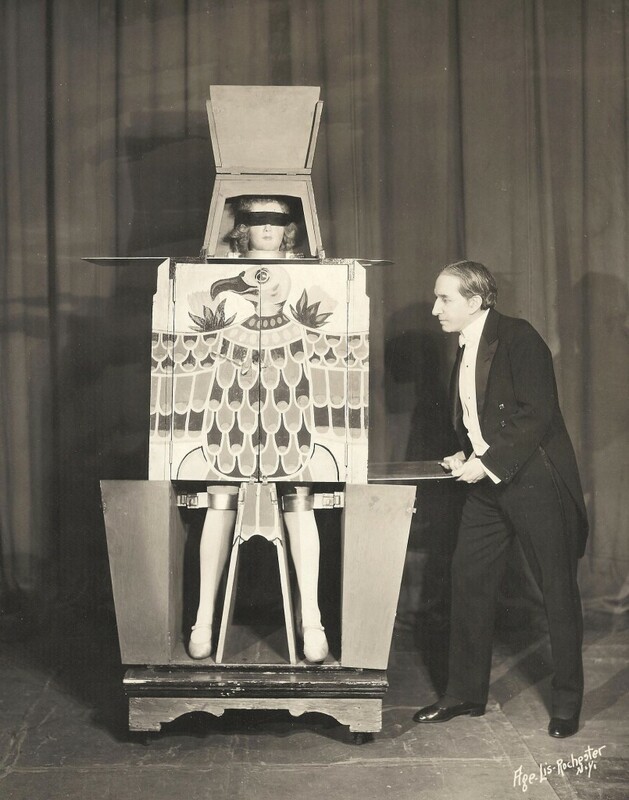 The two magicians toured together for Kellar’s final season, and the following year, Kellar retired and passed Thurston the title of “The World’s Greatest Magician.” One of the few illusions from Kellar’s show that Thurston continued to use was the Spirit Cabinet Illusion. 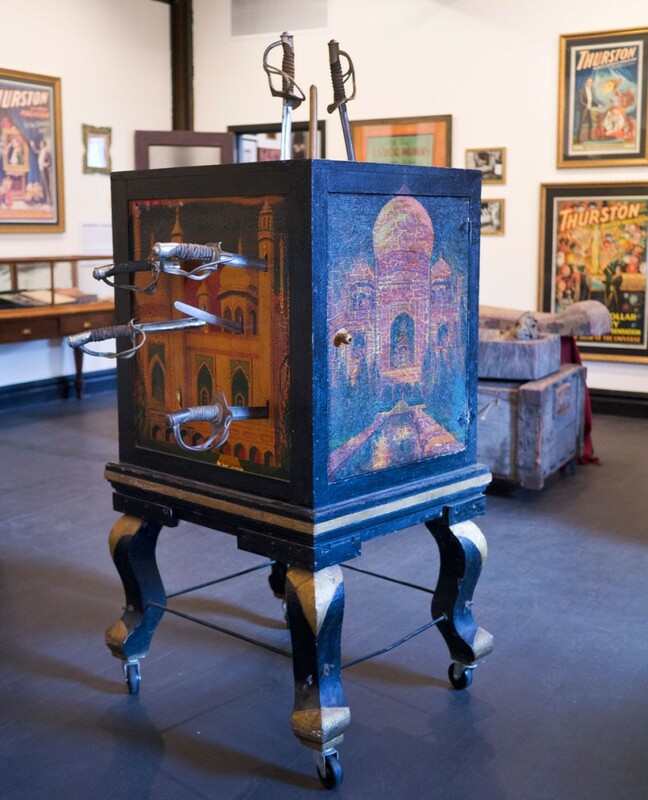 Feldman’s collection includes a later version of the Spirit Cabinet, which resembles a three-sided folding screen with velvet-lined holes for hands to reach through. After a magician or assistant was locked inside, floating instruments such as jangling bells and tambourines would appear above the prop, their cacophony indicating the spirits were present. Though still drawing major crowds, Thurston invested heavily in new acts throughout the 1910s, and his business was barely breaking even. He worked tirelessly to perfect the legendary Indian Rope Trick, whereby a rope rises into thin air, a boy assistant climbs to the top, and then disappears into thin air. His team developed a Spirit Painting Illusion, whereby shapes would materialize onto blank canvases, illustrating subjects chosen by the audience. The renowned magician also explored ways of supplementing his income offstage, such as selling decks of souvenir playing cards or books of magic tricks. Left, a 1908 poster features Kellar passing the mantle to Thurston. Image courtesy Rory Feldman. Right, Thurston’s Spirit Cabinet on view at the Morbid Anatomy Museum. Image courtesy Joanna Ebenstein. At his career’s peak, Thurston was traveling with a 30-member troupe and 40 tons of scenery, props, animals, machinery, and costumes, requiring a full eight train cars. Yet every season he attempted to outdo himself, Thurston incurred more debt in the process. “Thurston was super successful,” says Feldman, “but he was always spending money on orange groves, gold mines, and various inventions. He put money into products like Thurston’s Magic Box of Candy and a quack device to prevent snoring. It’s tricky to know exactly what actually happened, but he didn’t die wealthy.” Thurston’s death in 1936 signaled the imminent decline of the magic stage show. 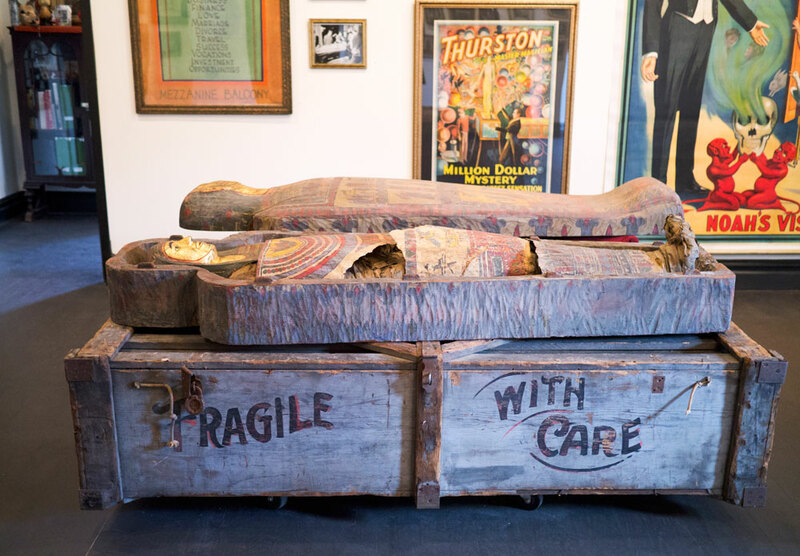 The Luxor Mummy rests inside its elaborate coffin. Image courtesy Joanna Ebenstein. Thurston often related an anecdote about a dying child who mistook the magician for Jesus. “Whether it’s true or not, there’s a story that Thurston was in a small town and saw an African American child who had been hit by a car or a train,” Ebenstein explains. “He went to the child as the boy was dying, and the child asked him, ‘Are you Jesus Christ?’ Thurston said, ‘Yes, I am.’ To me, that is shamanism at its core—the child needed to believe in Jesus Christ, and the simulation or deception was to help him, to move him through this transition toward death.” Though it’s an extreme example, the story reminds us that deception can have beneficial effects; perhaps audiences were drawn to magic shows because they let them confront their greatest fears. EXCELLENT written article! And AMAZING exhibit! Thanks for sharing. What a fantastic article, and what a historical injustice that Howard Thurston’s career isn’t better known. Thanks so much for “lifting the veil”! Terrific!!! I was very much in the same boat with the public and knew very little about Mr. Thurston, except through very small references in various biographies of Houdini which I read as a much younger man. I love the video included as well. So informative and entertaining. Well Done!!! Is there a museum somewhere for Howard Thurston, other then Columbus, Ohio? Thank you. “ ” At its height, the Brookdale could seat up to 15,000 people a day. No other restaurant on Earth could do that.